DAVOS, SWITZERLAND - The foreign ministers of Japan and South Korea on Wednesday exposed a deepening rift between the two countries despite agreeing on the need to maintain close communication, as Seoul made fresh accusations over allegedly provocative flights by the Self-Defense Forces. Their meeting, held on the fringes of the World Economic Forum Annual Meeting in Davos, Switzerland, marked the first face-to-face talks between the two ministers since bilateral ties chilled over wartime labor compensation and disputes over military encounters. In response, Kono said he felt South Korea’s announcement was “regrettable” and denied that Japanese planes conducted low-altitude flights. Earlier in the day in Seoul, Suh Wook, head of the Joint Chiefs of Staff’s operational headquarters, said the South Korean military was forced to respond after a Japanese patrol plane flew about 60 to 70 meters above a naval vessel in the East China Sea at around 2 p.m. on Wednesday, after similar low-altitude flights by Japanese aircraft on Jan. 18 and Tuesday. “We have clearly requested the Japanese government to stop this from happening again, but seeing the plane fly low again today, we cannot but take this as a clear provocation against a vessel of a friendly country,” Suh said at a briefing. The South Korean Defense Ministry later summoned a Japanese defense attache in Seoul to lodge a protest. “We did not carry out a flight that could be taken as a threat and this has been conveyed to the South Korean side,” he told reporters. On the alleged flight Wednesday, Iwaya said the SDF plane maintained an altitude of at least 150 meters, countering South Korea’s claim that it flew much lower. Flying above 150 meters is in line with domestic and international laws. 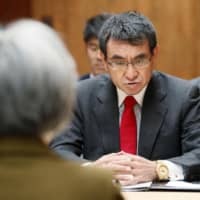 On wartime labor issues, Kono, in his meeting with Kang, urged Seoul to take concrete steps to address their dispute and accept Tokyo’s recent request to launch bilateral consultations, according to a Japanese Foreign Ministry official. The two have not held direct talks since South Korea’s top court ordered Japanese firms in October and November to compensate laborers forced to work during Japan’s 1910-1945 colonial rule of the Korean Peninsula. Tension also increased after a South Korean district court earlier this month granted a request to seize assets held by Nippon Steel & Sumitomo Metal Corp. — one of the companies ordered to compensate forced laborers — that was presented by lawyers representing four local plaintiffs. The official said the Japanese and South Korean foreign ministers spent significant time in their meeting discussing the issue. Details of the exchanges have not been released, but the two apparently failed to reach a breakthrough. Kang is believed to have spoken in line with the position taken by South Korean President Moon Jae-in, who said earlier this month that his government must respect judicial decisions. Tokyo views the top court rulings as flouting international law. It maintains that the issue of compensation was dealt with “completely and finally” under a bilateral accord to settle property claims, signed alongside the 1965 Japan-South Korea treaty that established diplomatic ties. Despite the growing need to cooperate in achieving the denuclearization of North Korea, issues related to wartime history remain a source of diplomatic friction. In recent weeks, Tokyo and Seoul have also brought to the fore a sharp division over a South Korean navy vessel’s alleged locking of fire-control radar on an SDF patrol plane. After concluding on Monday that South Korea’s denial is baseless, Japan’s Defense Ministry severed working-level talks to look into the Dec. 20 radar incident in the Sea of Japan. Japan has presented video and audio clips that it says show fire-control radar was used, in an effort to counter South Korea’s claim that the SDF patrol plane flew menacingly low toward the navy ship. The incident was also touched upon during the ministerial meeting in Switzerland, with Kang pressing Japan to continue the working-level talks. 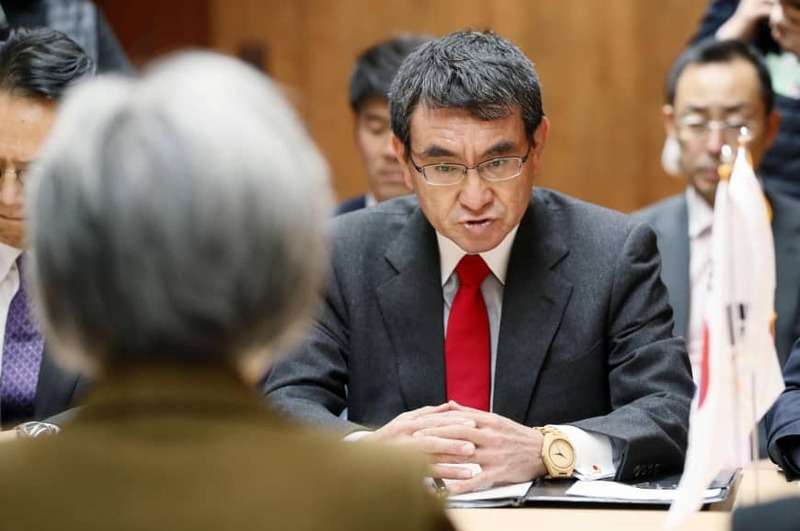 But despite bilateral ties being overshadowed by a series of disputes, Kono and Kang agreed on the importance of maintaining close communication directly as well as among other officials at their ministries, according to the Japanese Foreign Ministry official. The two also affirmed their cooperation in working toward the denuclearization of the Korean Peninsula, as well as a successful second summit between the United States and North Korea in February. The meeting was scheduled for 30 minutes but actually lasted for about an hour, the official said.